The aim was to identify potential microRNA (miRNA) biomarkers of type 2 diabetes. Controlled studies were retrieved from PubMed to compare miRNA expression profiles of type 2 diabetes and nondiabetic control samples. Meta-analysis under a random effects model was conducted. Subgroup analyses examined tissue specificity and species specificity. Sensitivity analyses were also performed to explain the heterogeneity among studies. Results were represented as log odds ratios (logOR), 95% confidence intervals (CI) and p values after Bonferroni correction. Among 343 differentially expressed miRNAs in 38 miRNA expression profiling studies published between 1993 and March 2014, only 151 miRNAs were tested by multiple studies, out of which 102 miRNAs were reported to be upregulated or downregulated. Meta-analysis identified 51 significantly dysregulated miRNAs. The top upregulated miRNA was miR-142-3p (logOR 6.4721; 95% CI 4.9537, 7.9904; adjusted p = 4.60 × 10−16). The top downregulated miRNA was miR-126a (logOR 7.5237; 95% CI 4.7159, 10.3316; adjusted p = 3.01 × 10−07). The dysregulation of two miRNAs (miR-199a-3p and miR-223) was highly pancreas-specific and liver-specific. 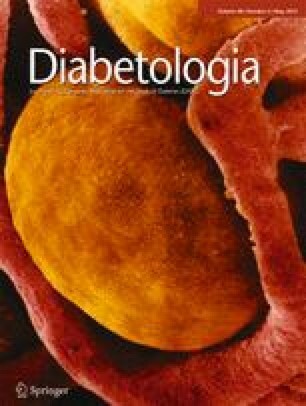 miR-30e was downregulated in patients with type 2 diabetes, while miR-92a was downregulated in animal models of diabetes. In sensitivity analysis, 40 out of 47 miRNAs (85%) were robustly and consistently dysregulated. This meta-analysis confirms that 40 miRNAs are significantly dysregulated in type 2 diabetes. miR-29a, miR-34a, miR-375, miR-103, miR-107, miR-132, miR-142-3p and miR-144 are potential circulating biomarkers of type 2 diabetes. In addition, miR-199a-3p and miR-223 are potential tissue biomarkers of type 2 diabetes. The online version of this article (doi: 10.1007/s00125-015-3510-2) contains peer-reviewed but unedited supplementary material, which is available to authorised users. Type 2 diabetes is a complex metabolic disorder characterised by insulin resistance  that is often undetected until hyperglycaemia is observed . Over time, multiple organ damage can occur, especially to the heart, blood vessels, eyes, kidneys and nerves ; thus, exploring novel early biomarkers and therapeutics for diabetes is of great importance. MicroRNAs (miRNAs) are likely to represent early biomarkers of type 2 diabetes that can be used to detect and monitor progression of the disease . miRNAs are a class of small (approximately 22 nucleotides), endogenous, noncoding, highly stable RNAs that regulate gene and protein expression. miRNAs are involved in many biological processes, including cellular differentiation, metabolism and cancer development [5, 6, 7], and their modes of dysregulation are linked to many diseases . In studies attempting to identify novel early biomarkers of type 2 diabetes, miRNA expression profiling was often performed in cultured cells, blood or solid tissue samples [9, 10, 11, 12]. Large numbers of miRNAs were identified to be differentially expressed, either overexpressed or underexpressed, while only a small number may actually be important signatures or therapeutic targets. Different profiling studies have employed different profiling platforms and different methods. It is, therefore, challenging to determine which miRNAs are potential biomarkers, which miRNAs are tissue-specific, whether circulating miRNAs make the best biomarkers and whether animal models are sufficient for pilot studies. The results of these studies are, however, subject to evaluation by meta-analysis. Recent studies have indicated that the seminal findings from academic laboratories could only be reproduced 11–50% of the time [13, 14]. A survey on data reproducibility of biomedical science also found the problem of data irreproducibility . As literature reviews on miRNAs in type 2 diabetes were purely narrative without any meta-analysis, it came as no surprise that the overall findings were inconsistent (Table 1). Therefore, no consistent and definitive picture is available. For example, a review  reported that the regulation of miR-103 in adipose tissue was different according to different experiments, while a second review  deemed miR-103 to be downregulated in adipose tissue and a third review  found it to be upregulated in adipose tissue. This study aims to fill this gap by using a meta-analysis to identify consistently dysregulated miRNAs that have been shown in reproducible profiling results to be potential biomarkers for type 2 diabetes. PubMed was searched for type 2 diabetes miRNA expression profiling studies published between 1993 and 11 March 2014 using the following terms: (‘miRNA’, ‘diabetes’ and ‘expression’ in the title/abstract) or (‘miRNA’, ‘diabetes’ and ‘profile’ in the title/abstract) or (‘miRNA’, ‘diabetes’ and ‘profiling’ in the title/abstract) or (‘microRNA’, ‘diabetes’ and ‘expression’ in the title/abstract) or (‘microRNA’, ‘diabetes’ and ‘profile’ in the title/abstract) or (‘microRNA’, ‘diabetes’ and ‘profiling’ in the title/abstract). Eligible studies had to meet the inclusion criteria: (1) they were miRNA expression profiling studies on patients with type 2 diabetes or on animal models of diabetes; (2) they used diabetic and nondiabetic control samples for comparison; (3) they used miRNA expression arrays; (4) they reported cut-off criteria of differentially expressed miRNAs; and (5) they reported sample sizes. miRNA profiling studies using saliva or urine of type 2 diabetes patients were excluded because we focused on miRNAs in blood, and miRNAs studies in saliva and urine were mostly related to oral cancer  and urinary tract cancer [22, 23, 24], respectively. From the full text and supplementary information of each expression profiling study, the following eligibility items were collected and recorded: first author, year of publication, location of study, selection and characteristics of recruited type 2 diabetes patients or animal models of diabetes, miRNA expression profiling platform, sample sizes, tissue types, cut-off criteria of upregulated and downregulated miRNAs and the list of differentially expressed miRNAs and their corresponding fold changes (if available). Quality assessment of microarrays was performed according to the Minimum Information About a Microarray Experiment (MIAME) guideline version 2.0 . Studies involving quantitative PCR (qPCR)-based miRNA arrays were assessed according to the Minimum Information for Publication of Quantitative Real-time PCR Experiments (MIQE) guideline , which is equivalent to the MIAME guideline. Extracted data were transferred to the statistical software R (Revolution R Enterprise, version 6.1.0) with the Metafor package (http://cran.r-project.org/web/packages/metafor/index.html, version1.9-5)  for meta-analysis under a random effects model. The outcomes are presented as log10 odds ratios (logORs), based on the numbers of dysregulation events in both type 2 diabetes and nondiabetic control samples, with their 95% confidence intervals. Bonferroni corrections were performed on p values. Adjusted p values less than 0.05 were considered significant. When compared with nondiabetic control groups, a significant logOR higher than 1 indicated miRNA upregulation. When compared with the diabetic group, a significant logOR higher than 1 indicated miRNA downregulation. Potential circulating biomarkers should be significantly upregulated or downregulated and detectable in both human and animal blood or in both blood and tissues. Potential tissue biomarkers should be significantly upregulated or downregulated and highly tissue-specific. Differentially expressed miRNAs in type 2 diabetes and nondiabetic control samples were ranked according to the following order of importance: (1) p values; (2) the number of consistent reports; and (3) logOR values. miRNAs are differentially expressed among tissue types and species, with corresponding overall effects and heterogeneities. Subgroup analyses split the extracted data according to tissue types and species in order to compare miRNA expression profiles among tissue types (blood, muscle, pancreas, liver, etc.) and species (i.e. tissue specificity and species specificity). Studies using serum, plasma or peripheral blood mononuclear cells were classified as blood as they were from blood and aimed to investigate circulating miRNAs. Studies that did not report the pancreatic tissue was whole pancreas or pancreatic islets were pooled with the other studies on pancreatic islets. Sensitivity analysis was performed on the sample size to test the robustness of findings. Sample size is a dominant factor that affects precision in determining the overall effects. Thus, the meta-analysis was repeated after excluding the studies for which sample sizes were ten or less. Figure 1 shows the selection process of the studies. A total of 253 potentially relevant studies were identified in PubMed. After removal of duplicated publications and reviews, 38 articles met the eligibility criteria. Details of study characteristics are shown in Tables 2 and 3. Among the 38 included studies, 22 reported only human miRNA expression profiles (Table 2), 15 focused on miRNA expression profiles in animal models (Table 3), and only one was based on both humans and animals. The numbers of differentially expressed miRNAs ranged from 1 to 130, with a median of 10. Fold change information of miRNAs was available in 17 of the 38 studies. MIAME guideline 2.0  and MIQE guideline  were used to assess study quality. Figure 2 and electronic supplementary material (ESM) Table 1 summarise the quality assessment process. Of the included studies, 74% did not report raw data of hybridisation and 82% of studies did not give sufficient information about experimental design and sample data relationships. For more than 30% of the studies, other key aspects (such as final processed data and array design) were not always fully reported. Out of 343 differentially expressed miRNAs reported in the 38 studies that compared type 2 diabetes samples with nondiabetic control samples, 151 miRNAs (44.0%) were reported in at least two substudies. Among the 151 differentially expressed miRNAs, 51 (33.8%) were consistent in their direction of dysregulation (30 were reported to be upregulated and 21 downregulated). In the meta-analysis of dysregulated miRNAs, the dysregulation of these 51 miRNAs was significant, as shown in ESM Tables 2 and 3 (30 upregulated and 21 downregulated). The most reported upregulated miRNA was miR-29a, which was reported in ten substudies with an adjusted p = 3.72 × 10−14. miR-487b (adjusted p = 6.24 × 10−06) was the most reported downregulated miRNA, which was reported in four substudies. Eighteen of the 38 studies investigated circulating miRNAs, which used plasma, serum, peripheral blood mononuclear cells and whole blood as profiling samples. Six investigated muscle tissue, eight investigated pancreas tissue, three investigated glomeruli tissue, six investigated liver tissue and six investigated adipose tissue. Among the eight pancreas tissue profiling studies, five studies reported using pancreatic islets and the others reported using whole pancreas. Details are shown in Tables 2 and 3. Significant dysregulation of miRNAs in different tissue types is shown in ESM Tables 4–9. Among the dysregulated miRNAs, ten upregulated miRNAs (miR-103, miR-107, miR-132, miR-143, miR-144, miR-21, miR-29a, miR-29b, miR-34a and miR-375) were consistently reported in at least two tissue types, while 36 miRNAs (26 upregulated and ten downregulated) were reported in only one tissue. The other two dysregulated miRNAs (miR-199a-3p and miR-223) were upregulated in one tissue type and downregulated in another (ESM Table 10), which suggests that their regulation is highly tissue-specific. In subgroup analysis of species, 190 miRNAs were reported in 23 human profiling studies with 54 reported in at least two substudies. Among these 54 miRNAs, 18 were upregulated and seven were downregulated (ESM Table 11), while differential expression of the other 29 was not significant (adjusted p > 0.05). A total of 241 miRNAs were reported in 16 animal profiling studies with 119 reported in at least two substudies. Among the 119 differentially expressed miRNAs, 35 miRNAs had adjusted p values <0.05 (27 were upregulated and eight were downregulated). Details are shown in ESM Table 12. Comparison of upregulated miRNAs (n = 30) in all profiling studies showed that miR-185 (adjusted p = 6.29 × 10−05), miR-187 (adjusted p = 5.27 × 10−05) and miR-103 (adjusted p = 1.40 × 10−03) were upregulated in human profiling studies, while miR-19a (adjusted p = 9.47 × 10−04), let-7d (adjusted p = 5.53 × 10−06), miR-191 (adjusted p = 1.14 × 10−04), miR-320 (adjusted p = 2.08 × 10−06), miR-27a (adjusted p = 5.36 × 10−04) and miR-29b (adjusted p = 1.57 × 10−07), amongst other miRNAs, were upregulated in animal profiling studies. Comparison of significantly downregulated miRNAs (n = 21) in all profiling studies showed that miR-652 (adjusted p = 8.64 × 10−05) and miR-30e (adjusted p = 5.56 × 10−08) were downregulated in human profiling studies, while miR-92a (adjusted p = 3.15 × 10−04) was downregulated in animal profiling studies. These results indicate that miRNAs might be expressed differently in various species. Human tissue-specific and animal tissue-specific miRNAs had already been analysed. There were no sufficient samples for analysis; thus, the results are not included in this manuscript. Sensitivity analysis was conducted to examine the robustness of the findings and to determine what effect sample size had on the overall analysis. Thirty of the 38 included reports had sample sizes greater than ten. We excluded studies where sample size was no more than ten. Analysing the thirty studies identified 47 miRNAs that were significantly differentially expressed, with 29 upregulated and 18 downregulated (ESM Table 13). Forty of the 47 miRNAs (85%) were significantly differentially expressed both in the sensitivity analysis and the overall analysis, while the other seven were not significantly differentially expressed in the overall analysis. This result indicated that the small sample sizes used in miRNA profiling studies may explain some differences in the results of miRNA profiling studies. This study is the first meta-analysis of type 2 diabetes miRNA expression profiling studies and identified specific miRNAs as potential biomarkers of type 2 diabetes. A Venn diagram of miRNA categories and a flow chart of the meta-analysis is shown in Fig. 3. A total of 151 differentially expressed miRNAs were reported in at least two independent substudies. Among these 151 miRNAs, only 51 (34%) were significantly differentially expressed, while 100 (66%) were not. This result is not a surprise as initially we expected that the number of significantly differentially expressed miRNAs might be the same as or less than that of nonsignificantly differentially expressed miRNAs. Several factors may explain the meta-analysis results of the differentially expressed miRNAs, such as publication bias, biological complexity (for example, variations in environmental backgrounds and gene susceptibility), insufficient information about the pattern of miRNA expression in different tissue types (the heterogeneity in different kinds of specimens) and heterogeneous conditions. The miRNAs exert actions in different tissues, while circulating miRNAs hold much promise as biomarkers of type 2 diabetes. In the tissue subgroup study, 36 miRNAs were only expressed in one tissue, while two (miR-199a-3p and miR-223) were upregulated in one tissue and downregulated in another. Ten miRNAs (miR-103, miR-107, miR-132, miR-143, miR-144, miR-21, miR-29a, miR-29b, miR-34a and miR-375) were consistently reported in multiple tissue types, for example muscle, adipose tissue, liver and pancreas, and seven of these (miR-103, miR-107, miR-132, miR-144, miR-29a, miR-34a and miR-375) were identified in blood. This finding indicates that circulating miRNAs hold much potential as biomarkers of type 2 diabetes . Laterza et al  and Kosaka et al  have demonstrated how circulating miRNAs may indicate the physiological state at the tissue level. The miRNAs that circulate in the blood are in a stable form and remain stable even after multiple freeze–thaw cycles. They can be detected by minimally invasive techniques  and are specific to tissue and disease states . If these miRNAs in circulating blood can serve as biomarkers, they would provide a minimally invasive biomarker approach that would be extremely useful in diagnosing and monitoring type 2 diabetes. Studies on multiple tissues were also analysed (ESM Table 14). Ten miRNAs with significant differential expression were consistently found in liver and adipose tissue among all the studies. The high agreement between the liver and adipose tissue analyses indicate the reliability of liver-specific and adipose-tissue-specific miRNAs. However, more studies are needed to identify miRNAs that are tissue-specific in other tissue types. miRNAs can be differentially expressed between animals and humans. Although animal studies might be informative about type 2 diabetes indicators in humans, animals are still different from humans. In the species subgroup analysis, the differential expression of some miRNAs was significant in both humans and animals, but other miRNAs, such as let-7d (adjusted p = 5.53 × 10−06) and miR-29b (adjusted p = 1.57 × 10−07), were significantly differentially expressed in animals but not in humans. These results indicate that miRNAs can be differentially expressed in various species and animal models are insufficient to determine indicators of type 2 diabetes in humans. Thus, miRNAs identified as candidates in animal models require verification in humans. This study identified ten miRNAs (miR-103, miR-107, miR-132, miR-142-3p, miR-144, miR-199a-3p, miR-223, miR-29a, miR-34a and miR-375) as potential biomarkers of type 2 diabetes, including circulating and tissue biomarkers. Circulating biomarkers are preferred to tissue biomarkers due to easier sampling and testing. For extensive validation of tissue biomarkers, animal experiments would be less costly than clinical studies. In cases in which resources for clinical studies are constrained, we would suggest validating the tissue miRNA biomarkers commonly found in both animals and humans before those found only in humans. The potential circulating biomarkers detected in both human and animal blood or in both blood and tissues are shown in Fig. 4. The potential tissue biomarkers were miR-199a-3p and miR-223. Among all the profiling studies, the most frequently reported (ten studies) and upregulated miRNA was miR-29a (adjusted p = 3.72 × 10−14), which was overexpressed together with miR-29c (adjusted p = 5.13 × 10−10) during hyperglycaemia and hyperinsulinaemia. Overexpression of the miR-29 family impairs insulin-stimulated glucose uptake by inhibiting insulin signalling via the Akt signalling pathway . miR-34a (adjusted p = 3.69 × 10−14) ranked second among the upregulated miRNAs in all profiling studies. miR-34a in beta cells increased in response to palmitate, impairing nutrient-induced insulin secretion by repressing vesicle-associated membrane protein 2 (VAMP2) expression  and making the beta cells more susceptible to apoptosis . miR-103 and miR-107, which play a central role in regulating insulin sensitivity by targeting caveolin-1 (a regulator of the insulin receptor) , were upregulated in the blood of both humans and animals in our analysis. The most upregulated miRNA in human profiling studies was miR-375 (adjusted p = 3.60 × 10−13), which inhibits insulin secretion by repressing its targets myotrophin  and phosphoinositide-dependent protein kinase-1 (PDK1) . In both overall analysis and subgroup analysis of species, miR-144 (adjusted p = 4.81 × 10−10) and miR-142-3p (adjusted p = 9.71 × 10−13) were upregulated in human type 2 diabetes blood samples. miR-144 impairs insulin signalling by inhibiting the expression of insulin receptor substrate 1 (IRS1)  and miR-142-3p regulates Akt1 (also known as protein kinase Bɑ) in adipogenesis regulation [73, 74]. In the subgroup analysis of tissue types, miR-223 was downregulated in one tissue and upregulated in another. Upregulated miR-223 in cardiomyocytes induces glucose transporter 4 (GLUT4) protein expression to restore normal glucose uptake . miR-132 was upregulated in both blood and liver. miR-132 targets insulin-mediated regulation of CYP2E1 (cytochrome P450, family 2, subfamily E, polypeptide 1), which is involved in hepatic metabolism . miR-132 inhibits the expression of LRRFIP1 (leucine-rich repeat (in Flightless 1) interacting protein-1) to block vascular smooth muscle cell proliferation in atherosclerosis and restenosis , and miR-144 is reported to regulate haematopoiesis and vascular development by repressing the expression of meis homeobox 1 . Likewise, the miR-29 family, which directly targets Mmp2 (the matrix metalloproteinase 2 gene), Col1a1 (the collagen, type I, alpha 1 gene) and Col3a1 (the collagen, type III, alpha 1 gene), is involved in renal and cardiovascular injury . miR-34a modulates p53 that is related to human atherosclerosis . It also inhibits sirtuin-1 and HMGCR (3-hydroxy-3-methyl-glutaryl-CoA reductase) in nonalcoholic fatty liver disease . miR-375 targets caveolin1, janus kinase 2 (JAK2) and yes-associated protein 1 (YAP1) that are related to cancer [81, 82]. These plausible relationships indicate that miRNAs are associated with not only type 2 diabetes but also the complications of type 2 diabetes. Since specific miRNAs were consistently detected as being dysregulated in multiple studies of (1) both human and animal blood or (2) both blood and tissues, they represent potential biomarkers of type 2 diabetes for extensive validation. This meta-analysis of type 2 diabetes miRNA expression profiling studies identified 40 significantly dysregulated miRNAs. Eight miRNAs (miR-103, miR-107, miR-132, miR-144, miR-142-3p, miR-29a, miR-34a and miR-375) are potential blood biomarkers, while two miRNAs (miR-199a-3p and miR-223) have high tissue-specific regulation and are potential tissue biomarkers. The work of HZ and SL has been sponsored by two research grants (MYRG190-Y3-L3-ICMS11-LSW and MYRG2014-00117-ICMS-QRCM) received from the University of Macau. SL is the guarantor of this work and conceived the meta-analysis. SL and HZ designed the protocol. HZ searched the databases, assessed and selected studies, and extracted and analysed the data from the selected studies according to the eligibility criteria. SL and HZ interpreted the data and drafted a report on the findings. SL revised the manuscript for submission. All authors read and approved the final version of the manuscript.